Headphone Test Sequence – Listen, Inc. The purpose of this sequence is to test a stereo headphone set. Both left and right earphones are measured simultaneously using a standard 1/12th Octave stepped-sine sweep from 20 to 20 kHz. The analysis is then performed using our HarmonicTrak™ algorithm that measures harmonic distortion and fundamental frequency response simultaneously. Then the diffuse-field and free-field corrected curves are calculated. The diffuse-field correction curve compensates for the overall frequency response from the diffuse-field (sound in every direction) to the eardrum and includes the effects of the head, torso, pinna, ear-canal and ear simulator. The free-field correction curve compensates for the overall frequency response from the free-field (sound at 0 degree incidence to the nose of the Head and Torso Simulator – HATS) to the eardrum. 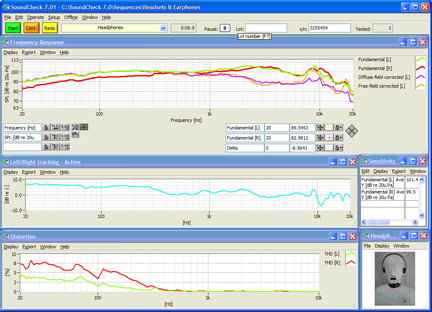 Further post-processing of the signal compares left and right earphone responses to show the difference curve (magnitude and phase are available). The average sensitivity from 100 to 10 kHz for both left and right earphone is calculated and the total harmonic distortion displayed. Caution: Dynamic headphones typically need very little voltage e.g. 100mV to produce high sound pressure levels, therefore it is best to use a dedicated headphone amplifier. A normal power amplifier can output a voltage level that will damage most headphones if used at full gain. Connect left and right outputs of the sound card to the corresponding inputs of the headphone amplifier. To calibrate the headphone amplifier, follow directions in the SoundCheck manual for amplifier calibration. The Head and Torso Simulator (HATS) both left and right ear simulator needs to be calibrated before measuring the headphones. Refer to the HATS manual for further instructions on mounting a microphone calibrator over its artificial ears. In the SoundCheck Microphone calibration editor, select B&K 4231 & UA 1546 ear adaptor for calibrating the B&K 4128 HATS artificial ears (similar in sensitivity to the B&K 4134 pressure mic). 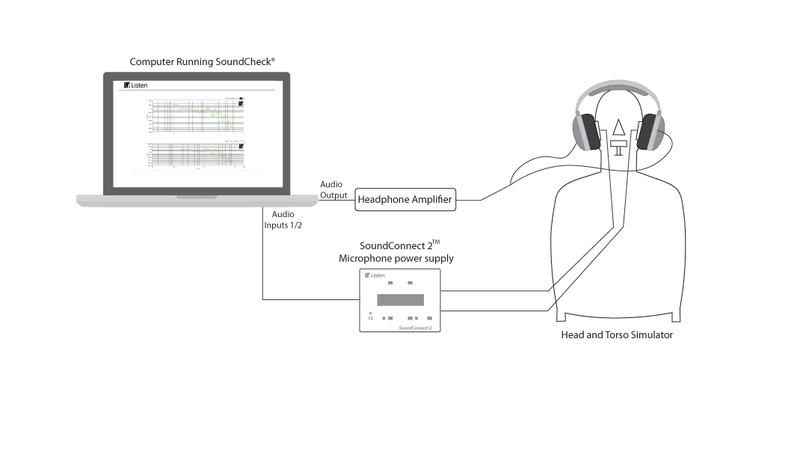 Connect the left and right artificial ear into two SoundConnects or a two-channel microphone power supply and the microphone power supply into the left and right inputs of the sound card. Use the manual signal generator and multimeter to determine what test level causes what headphone output SPL e.g. determine test voltage level for 100 dBSPL for measuring distortion. You are ready to start the sequence. If you just want to look at stored measurement data, select Recall Data at the beginning of the sequence. Measure impedance at the same time using a four channel sound card and two impedance boxes. To run the sequence in SoundCheck, please save the zip file to your hard drive, then follow the instructions in ‘Sequence Editor: Exporting/Importing a Sequence’ section of the manual.